If you are moving to Europe from the UK, Switzerland is one of the top countries to move to because of its spectacular scenery and high standard of living. The Moving Partnership provide competitive removals quotations to all parts of Europe including removals to Switzerland at the best possible prices. If you are moving to Geneva, we are the first port of call for home or office moves as we partner with hundreds of high quality European removals companies to find you the best possible rates. Whether you require specialist moves to Geneva, or simply home or office content removals, we find a tailored service to suit your requirements. Just contact Moving Partnership today to source the right company for your European move, so you can look forward to settling in your new home. Meanwhile, read on for our short city guide to Geneva. Removals to Switzerland – Click here for the best prices for domestic and commercial moves to Geneva. If you are moving house to Geneva, this beautiful, cosmopolitan city is an expensive place to settle, demonstrated by its luxury hotels and restaurants, high quality jewellers and fashionable stores. It is a global financial centre and if you are taking up employment in the city, you can generally expect a fairly high standard of living as it offers the third highest quality of life in the world for expats. One thing is for sure, if you are a foreigner moving to Geneva, you won’t feel out of place as it is a very international city with organisations such as the World Health Organisation, the Red Cross and the United Nations all based here. Although it is a French speaking canton, you will hear English conversations in bars and restaurants from time to time, as well as Russian, Spanish, German, Arabic and Italian. Geneva has a long and interesting history which actually pre-dates Roman times. It was a republic until the 1500s when it officially became part of Switzerland. Now, as well as breathtaking scenery, interesting attractions, a plethora of outdoor pursuits and some lively bars and restaurants, you will never be short of things to discover. Among some of the most popular attractions are its enormous fountain, Jet d’Eau, which shoots 140m into the air, although the best time to see it is at night when it looks all the more spectacular lit up. Another draw is St Pierre Cathedral, where you can have an archaeological tour, see the International Museum of the Reformation and enjoy a steep climb to the top of the towers for spectacular views over the city and beyond. The old town is a great place for a wander with its city hall to discover, along with quaint antique shops. 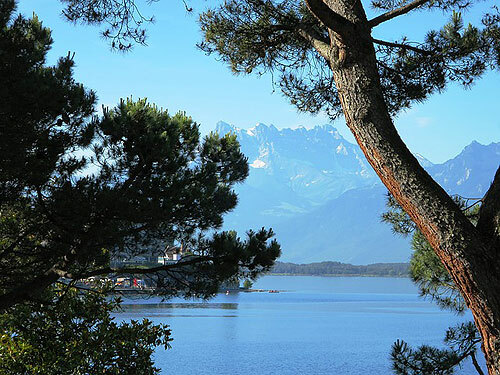 If you prefer outdoor pursuits, you’ll have plenty of opportunity to do all sorts of activities including sailing on the beautiful Lake Geneva, or skiing in the nearby mountains. Geneva is a luxury shoppers’ paradise from upmarket clothing and accessory stores to Swiss watches and jewellery. If you are after more low cost items, La Rue du Marché is one of the city’s busiest streets where you can find all sorts of things from pharmacies to shops selling household items. Of course, Swiss chocolate is a must have, and although you will find some speciality shops selling high quality chocolate, you will find it cheaper in some of the regular supermarkets. Geneva has a good number of restaurants offering food that reflects the international population. From crêperies to coffee bars and high end restaurants, there is a good selection to choose from. Among the upmarket eateries are Café des Negociants, a trendy restaurant where you need to book well in advance and Perle du Lac, a fantastic eatery with spectacular views over the lake. If you are moving to Geneva, the airport offers flights to a number of European airports, as well as daily transatlantic flights and direct flights to China. If you are travelling from the airport into the city centre, free tickets for the bus or train are available from the airport, although you must show your boarding pass to qualify. Transport within the city is efficient and bus or tram tickets can be bought from the machines at any bus stop. Other ways of getting about is by foot or by bike, although cycling is difficult to do in the old town because of the bumpy streets and passageways. International Removals to Switzerland - Contact Moving Partnership for competitive home content or office moves from the UK to Geneva, Switzerland, or click here for a free quotation.